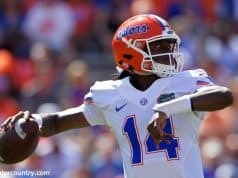 Can the Gators find the inspiration and intensity to play toe-to-toe with Florida State Saturday? / Gator Country Photo by David Bowie. It used to be relatively easy to scheme a defense against LSU. You played the run on first and second down, then played the pass on third down. The Tigers were so predictable, which probably has a lot to do with Alabama beating the Tigers in the 2011 national championship game and one of the reasons Will Muschamp was able to scheme the Gators to a 14-6 win over LSU last year in The Swamp. 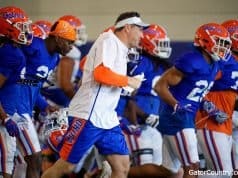 When Florida trots out on the field at Tiger Stadium Saturday, Muschamp and his defensive staff will have their hands full. This is one of the most dynamic offenses in the country with Zach Mettenberger playing like a first rounder at quarterback and Odell Beckham Jr. and Jarvis Landry playing like they’ll be starting somewhere in the league next year. Throw in the fact the Tigers have four running backs, all of whom would start for Florida, and you have yourself a full fledged dilemma. How do you scheme against these guys? Stack the run, they kill you with the pass. Drop seven into coverage and they pound you with the run. To win this game, Ronald Powell and Dante Fowler are going to have to play out of their minds coming off the edge and there can be no mistakes in the secondary, which is bolstered by the return of Marcus Roberson after missing three games with a knee injury. 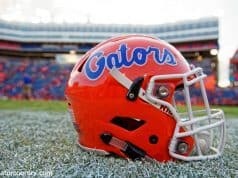 It will take Florida’s best effort of the year to win this one. The week after Florida’s defense was taken to school for more than 500 yards in a 47-35 loss to Mississippi State in Starkville, Steve Spurrier made wholesale changes, the most notable at quarterback where Rex Grossman got the start against LSU and its new coach Nick Saban. Grossman didn’t disappoint the sellout crowd at The Swamp, hitting 18-28 for 276 yards and three touchdowns, all to Jabar Gaffney including one on the most memorable play of his career. On Grossman’s first touchdown pass, center David Jorgensen snapped the ball over his head. Grossman looked like an outfielder the way he tracked the ball down, picked the ball up cleanly on the bounce, then turned and threw to the left corner of the north end zone where Gaffney came down with the pass for what went down as a 26-yard touchdown. 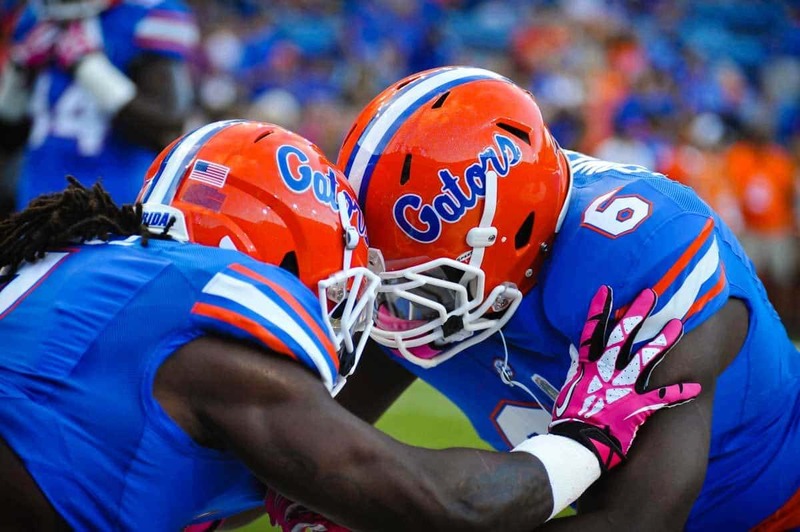 The Gators went on to hammer the Tigers, 41-9. Miami of Ohio did Tuesday what it knew it would have to do in November, so rather than delay the process, jettisoned Don Treadwell, who started the season 0-5. Miami has been on a downhill slide the last few years, a distressing turn of events at the place called “The Cradle of Coaches.” Given what Miami pays (about $400,000) it could go after some young coach with no proven track record, or do something smart like hire Ron Zook. Zooker doesn’t need the money (settlements at Florida and Illinois have him set for life), he’s an alum who played there for Bill Mallory, and he will definitely recruit like crazy and put the program in shape to compete with anyone in the MAC. I’ve always been convinced that in the right place, Zooker can win big and Miami of Ohio is the right place. Right now my top five would be (1) Marcus Mariota, Oregon (76-134 passing for 1,358 yards and 14 TDs; 28-338 rushing for 7 TDs); (2) Teddy Bridgewater, Louisville (104-145 passing for 1,562 yards and 16 TDs); (3) Tajh Boyd, Clemson (93-141 passing for 1,449 yards and 14 TDs); (4) A.J. McCarron, Alabama (90-126 for 1,048 yards and 10 TDs); and (5) Aaron Murray, Georgia (98-151 passing for 1,534 yards and 14 TDs). On the outside looking in I have (1) Johnny Manziel, Texas A&M (100-140 passing for 1,489 yards and 14 touchdowns; 48-314 rushing for 3 TDs); (2) Jameis Winston, Florida State (90-123 passing for 1,441 yards and 17 TDs); and (3) Zach Mettenberger, LSU (107-157 passing for 1,738 yards and 15 TDs). Even with Baylor and Oregon threatening to blow out a scoreboard at some point this season, the best stat of all belongs to Charlie Strong’s Louisville Cardinals. They are 5-0 and have yet to trail even 3-0. Of course, it’s not exactly like the Cardinals have been playing the toughest kids in the neighborhood. Their wins are against Ohio U, Eastern Kentucky (D1AA), Kentucky, Florida International and Shirley Temple. They play host to Rutgers Thursday in what promises to be their toughest game so far, but what chance does Rutgers have of shutting down Teddy Bridgewater? That vaunted Rutgers defense has given up 52 points twice already this year. Through the first five games of the season, Peyton Manning already has thrown for 20 touchdowns and 1,884 yards. He’s averaging an NFL phenomenal 9.52 yards per pass attempt and more than 360 passing yards per game. What makes the numbers even more phenomenal is the fact it took him into game five before he threw his first interception of the season. If he could maintain his current rate for the full 16-game schedule, then Peyton’s number project to 480-634 for 6,029 yards, 64 touchdowns and only three interceptions. Josh Freeman signed with the Minnesota Vikings for $2.7 million less than a week after the Tampa Bay Bucs released him. Freeman will still get paid the remainder of the $6.2 million the Bucs owe him for 2013. The Bucs, meanwhile, will struggle to win a game with Mike Glennon at quarterback. If there is a silver lining for the Bucs it is the possibility to draft either Jadeveon Clowney or Teddy Bridgewater next May in the draft. If the Bucs’ management gets struck by lightning and has a lucid moment, they’ll fire head coach Greg Schiano and offer Nick Saban $10 million a year to come to Tampa as the team president and general manager. I wouldn’t count on the Bucs’ management to actually have a lucid moment, however. Are there certain songs that when you hear them they stick in your mind the rest of the day? For reasons I cannot explain, “Little Latin Lupe Lu” by Mitch Ryder and the Detroit Wheels has always been one of those songs. The Righteous Brothers, The Kingsmen, Paul Revere and the Raiders, Trini Lopez, Bruce Springsteen and countless others have done the song. I’ve heard every version you can imagine, but the Mitch Ryder version sticks with me. I heard it Monday morning. It’s still in my head. That’s why you’re getting it. If I have to hear it playing in my head all day, then why not you?